: inspect these items on a cooled down engine. visually check that the air filter is not excessively damaged, dirty or oily. Peplace the air filter if necessary. 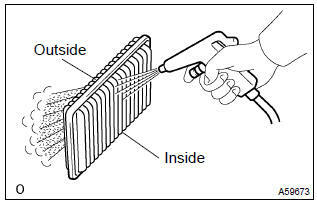 clean the filter with compressed air. First blow from the inside of the filter thoroughly then repeat from the outside. replace the air filter with a new one. visually check the fuel lines for cracks, leakage, loose connections, deformation and tank band looseness. visually check the pipes, hangers and connections for severe corrosion, leaks and damage.